The Brinkmann 4-Burner Propane Gas grill offers a total cooking area of 649 square inches and a total power of 40,000 BTUs out of its four burners, with a side burner of 12,000 BTUs. It should be enough to meet the needs of numerous guests and allow you to cook fast. 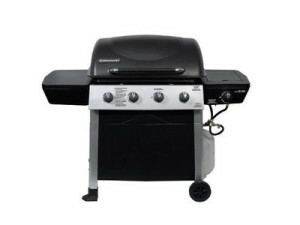 The Brinkmann 4-Burner Propane Gas grill is a powerful grill that allows even cooking and lights easily. It’s a good acquisition for amateur users due to the fact that it’s easy to use. It also gets very hot, so you should be able to cook fast. This grill is somewhat complicated to assembly and you shouldn’t be surprised if it takes you more than two hours to do it. However, this won’t be the major issue you are going to have with it. You will soon realize that many of this grill’s components are cheap and poor quality. The coating on it is not made of solid metal, so it may crack up around the handle if you are not careful with it. You will notice that the burners make a strange noise and that the cover is flimsy. It also doesn’t have any storage cabinet so it may be difficult to gather everything you need and have them handy when cooking. Be careful if you use the side table, as it doesn’t seem to be able to hold much weight. Also, you may notice that the ignition switch doesn’t work after the first time you use it. If you really need a grill for a certain occasion and you don’t have one, you might consider borrowing one from a friend or family member than buying the Brinkmann 4-Burner Propane Gas. Its poor quality materials make this a bad acquisition however you put it. It simply doesn’t seem to be worth it to buy it and use it only for several times before its components deteriorate. Even the low price doesn’t make up for it.